No, the link between terrorism and our foreign policy isn’t simple. But Jeremy Corbyn is basically right. Look at ISIS's own propaganda and it's clear that Western intervention is a key driver of their violence. 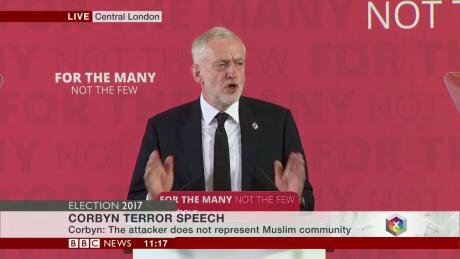 Jeremy Corbyn's speech on terrorism. BBC, fair use. Michael Fallon richly deserved to fall into the trap that Krishnan Guru-Murthy recently sprang on him, which saw him pouring scorn on words previously spoken by foreign secretary Boris Johnson. His spluttering insistence that we not seek to understand the motives of killers such as Salman Abedi represents politics at its most grating – as a brazen insult to the intelligence of the public. But behind the attacks faced by Jeremy Corbyn from both right and centre regarding his comments about the failure of the war on terror lies a serious and genuine debate. Can we really say, more than a decade after the Iraq War, that our foreign engagements are a major cause of jihadist terrorism at home? In a recent column in the Guardian, Jonathan Freedland pours scorn on what he admits is Jeremy Corbyn’s ‘carefully caveated’ position. His argument is that jihadists are driven primarily by an inward-looking ideology which hates us for who we are, not for what we do. As he points out, within this frame of reference, even inaction by the West – as in Bosnia for example – can be used as material by entrepreneurs of grievance. He’s not altogether wrong, but it’s more complicated than that. Take, for example, a recent propaganda article by ISIS themselves, with the usefully straightforward title “Why We Hate You and Why We Fight You”. The purpose of this article is exactly what it says it is: to clarify, once and for all, in the most straightforward terms, what the self-ascribed meaning of ISIS’s violence is. And yet, this being so, the remarkable thing is that the article isn’t clear at all. The piece opens by praising Florida nightclub killer Omar Mateen’s “attack on a sodomite, Crusader nightclub”, but goes on to express frustration at the idea that it might be considered a mere hate crime, or, worse, “senseless violence”. As ISIS insist, they have “repeatedly stated their goals, intentions and motivations” for violence, which are, it says, to be understood as “brutal retaliation” against “the crimes of the West against Islam and Muslims”, crimes which include “waging war against the Caliphate”, but also “insulting the Prophet” or “burning the Qur’an”. “Although some might argue that your foreign policies are the extent of what drives our hatred, this particular reason for hating you is secondary… the fact is, even if you were to stop bombing us, imprisoning us, torturing us, vilifying us and usurping our lands, we would continue to hate you” the piece insists. And yet, a few paragraphs earlier, it hints at the idea that a temporary cessation of violence might be possible: “even if you were to stop fighting us, your best-case scenario in a state of war would be that we would suspend our attacks against you – if we deemed it necessary – in order to focus on the closer and more immediate threats”. Utterly uncompromising as this all sounds, there is still a tension in the words. ISIS wants to declare an unlimited war on unbelief as such; but it also wants to retain the notion that it can use violence as strategic leverage, which requires at least some limited concession to the idea that it could choose to stop (even though it couldn’t choose not to hate). It is worth pointing out that this ideology is no different in its essentials from that upheld by hardline, but officially tolerated scholars in Saudi Arabia too: that there is an obligation for true believers to ‘hate’ all others, even if actual hot conflict can, for reasons of expediency, be put on what might in practice be indefinite hold. What conclusion can we draw from this? Certainly not that ISIS is worth cutting deals with. Rather, what it ought to reinforce is the point that ideology is not a sort of ineffable uncaused cause. However rigid and vicious, it doesn’t predict how a group or an individual will behave on its own. Even ISIS, for all its savagery and hatred, didn’t as such start its campaign of killing and direct incitement against Western targets and homelands prior to the first Western air strikes aimed at containing and rolling back its sudden advance into Iraq. If we have learned anything from the ‘war on terror’, it is that murderous ideologies (which increasingly often seem to be almost interchangeable), are not just things that fall from the sky, Invasion of the Body Snatchers style, but rather things which, like nettles, flourish in disrupted ground. Where military interventions – even interventions which may have been well-meaning – have led to anarchy, they have created conditions conducive to socialising young people into the habits and attitudes of seemingly incomprehensible violence. Libya is an obvious example. In the case of ISIS, a totalistic and expansive ideology may well provide ready justification for violence under almost any circumstance. But radical movements cannot flourish as fragmented archipelagos of true believers. In recent years, research into radicalisation has been increasingly interested in the role of wider milieus of people who have some emotional sympathy for the radicals, even if they don’t accept their specific beliefs. ISIS are well aware of this, and narratives of victimisation of Sunni Muslims are a key part of their attempts to reach a wider audience. The morning after the Manchester bombing, I happened to give a lift to a Syrian friend, a former politics professor, whose family had been obliged to leave the country because, among other things, the encroachment of ISIS into their hometown. Naturally, he was full of dismay about the attack, and concern for the victims; but after a few minutes, he added quietly that hardly a week goes by without his hearing from some friend or other about more civilians killed by Western air strikes. He wasn’t, of course, trying to use one to justify the other, or suggesting that the killer had himself been thus motivated. But he was in little doubt that this fact helps at least to blunt the outrage that some might otherwise feel at attacks on Western civilians. According to the monitoring group Airwars, the minimum estimate for civilians killed in Syria and Iraq by Western coalition airstrikes since August 2014 now stands at 3,681. But what if Corbyn is wrong in his assessment? What if there has been an evolution of the almost meteorological system of interaction between state failure, murderous militias, global media, identity crises in crumbling Western communities, and the ‘long tail’ effect whereby, if a group like ISIS solicits widely enough for killers, someone somewhere is bound to answer the call? What if the complex link between terrorism and foreign wars really has broken? Well then, the only real solution is to properly fund interventions at the level of our own communities, by building robust and trusted partnerships; to do that, and to deepen our cooperation with European and other partners. The need for better community policing is perhaps the single intervention most agreed upon by counter-terrorism experts. But police can’t do it if they aren’t resourced to do it, not to mention the many other public servants supposedly charged with a duty of care under the UK’s Prevent strategy. Theresa May can’t have it both ways.